Hudson's Evan Manley established a new pr of 15:33.30 on his way to finishing third. 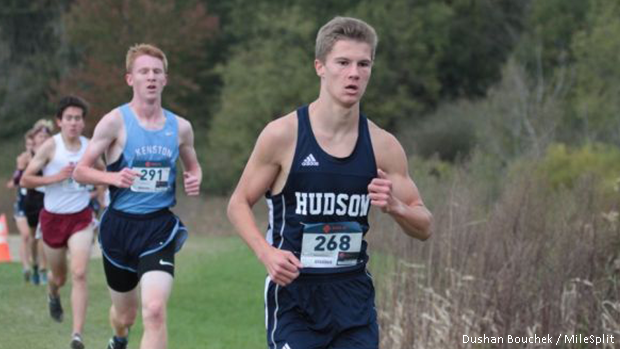 Entering the District - Trumbull County Division I race, the Hudson boys squad were the on-paper favorites and they made sure to deliver when it counted. The team put 43 points up for a resounding win, which no doubt added to their confidence heading into next weekend's regional meet at Boardman. The Explorers, who are ranked in a tie for first with Mason in the latest coaches poll, placed three runners in the overall top ten, led by Evan Manley, Jacob Russo and Lucas Lay, who all went sub 16 minutes. Hudson's 1-5 split was 42 seconds and the team's scorers averaged a 15:57 finishing time.